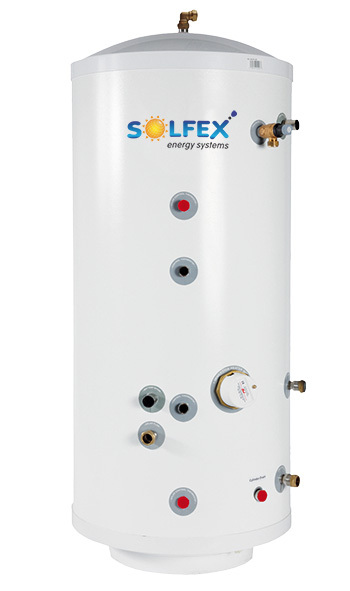 Solfex are proud to offer a complete range of unvented stainless steel cylinders specifically for heat pump applications providing mains pressure domestic hot water. Utilising an already well established stainless steel unvented hot water cylinder, this product has been developed to maximise the lower temperatures available from the heat pump. The heat exchanger is a totally new design. It consists of a multi-pass corrugated stainless steel tube in parallel to reduce the pressure loss whilst maximising the heat exchange. Many medium to large heat pumps need heat exchangers in the store that will cope with the higher flow rates associated with primary temperatures that are typically 50˚C or 60˚C. Due to the fact that many heat pumps will not raise the stored water temperature to 60˚C, which is necessary to prevent the growth of legionella, the SOLHP range of cylinders are supplied with an immersion heater and a thermostat. cylinders are factory pressure tested to a full 12 bar which is four times the normal working pressure. SOLHP cylinders use a high heat transfer corrugated tube heat exchanger to give a 20% faster recovery than plain tube. It is also lighter and stronger than plain tube making the vessel the lightest and easiest to handle on site. All SOLHP cylinders are manufactured using the very latest HCFC free EnviroFoam insulation. This has an Ozone Depletion Potential (ODP) of zero and an industry leading Global Warming Potential (GWP) of 0.7. Tests show that the 50mm of EnviroFoam insulation injected into the case and covering both domes achieves astonishingly low levels of heat loss, which ensures it is fully compliant with 2010 Part L requirements for both new build and replacement cylinders. The 25 year guarantee underlines the confidence the manufacturer has in its own products. Combination inlet group incorporating pressure reducing valve, strainer, check valve, balance cold take off point, expansion relief valve and expansion vessel connection points. In performance, it complies with the requirements of BS EN 806-1 to 5 and meets the NHBC criteria for domestic properties. Our manufacturing partner also operates a quality management system audited and accepted by the BSI in accordance with BS EN ISO 9001:2008. Fast reheat rate from its purpose designed low resistance coil. One of the highest insulation ratings on offer today. The Stainless Lite HP SOL is supplied with all the necessary connections including two dry thermostat pockets.